This example demonstrates the effect of referencing your data to an incorrect ellipse. First we define two coordinate systems - one using the World Geodetic System established in 1984 and the other using a spherical globe. Next we extract data from the Natural Earth land dataset and convert the Geodetic coordinates (referenced in WGS84) into the respective coordinate systems that we have defined. Finally, we plot these datasets onto a map assuming that they are both referenced to the WGS84 ellipse and compare how the coastlines are shifted as a result of referencing the incorrect ellipse. to transform the coordinate points of a geometry. that the resulting geometry would make any sense. # Define the two coordinate systems with different ellipses. # acquire the 1:10m physical coastline shapefile. # Create a Stamen map tiler instance, and use its CRS for the GeoAxes. # get hold of the coastlines for that area. # Add the Stamen aerial imagery at zoom level 7. # projections of differing ellipses. # both referenced to WGS84. # Create a legend for the coastlines. 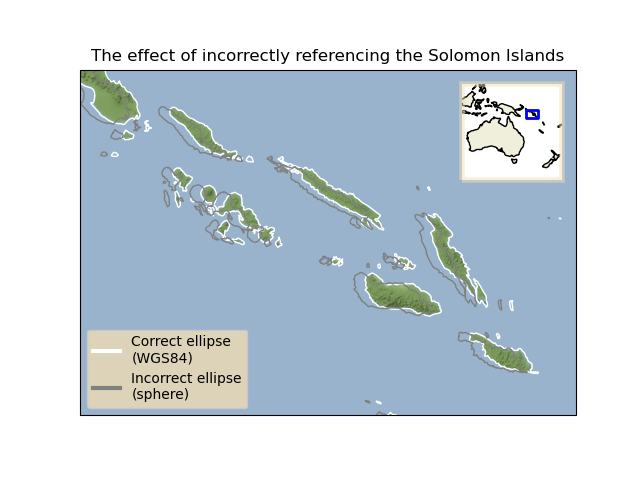 # Create an inset GeoAxes showing the location of the Solomon Islands. # Make a nice border around the inset axes. # Add the land, coastlines and the extent of the Solomon Islands.